The drums of war are beating. World Net Daily states that France is invoking the North Atlantic Treaty Article 5 to require ALL members of NATO go to a FORMAL war footing against the Caliphate, even while the French launch fresh attacks against ISIS targets in Syria and Mesopotamia, regardless of borders or whether or not it makes sense. They want to invoke “third block” war when they are using second-generation tactics to fight a fourth-generation war. There is fear that Syria and Russia will think this is a false-flag attack (the one in Paris) and an excuse to put down the Syrian regime. I see it as at least a chance to get the West to stop the insanity of supporting ANY Muslim faction (the Assad regime is not really Muslim and certainly not Islamist). Third World War? No, I think that the squatter in 1600 PA and the rest of the Tranzi scum in the capitals of Europe will not allow the West to go to war with the Ummah, let alone win it. But what is particularly ominous, as reported by WND, is that “congressional leadership” is discussing an internment of “ALL” Muslims in the Fifty States. a la the mass round-up of Japanese Americans in 1942. I find this even more ludicrous than the idea of going to war with “Radical Islam” or the Ummah. Frankly, Congress doesn’t have the guts to do this when we know that the tyrant will not. And even if it DID, overnight, dozens of cities would spring up as “sanctuary” cities for Muslims, and Katie bar the gate. Of course, maybe the Ummah will just collapse all by itself. Fox News tells us that many of the European and American converts to Islam, and particularly recruited to the Caliphate’s conquering armies, are finding not all is well. As Mama Liberty points out, it is extremely funny that they are upset because the coffee is bad (no Starbucks!!!) and the beauty shops are tacky and unfriendly, and the makeup styles are… unmentionable. Meanwhile, the touchy-feely sort of leftists, pawns of the Tranzi overloards, will continue to gut society. For example, the City of Greensboro, North Carolina, is trying to disarm its citizens and residents, according to a story in The Blaze. During a special “nonviolence event” the police department asked people to voluntarily sign a “nonviolence pledge” and also, voluntarily, turn in any “unwanted” firearms, especially handguns. There was no compensation, money or other, given for the weapons, and no information on how many were turned in. There is no idea or indication of how many people still have guns in Greensboro, so this may or may not be a good target for the next Islamist terrorist attack (never fear, there are many as good as Paris right here in North America). There was also nothing said about the police chief and his officers and staff leading by example, either in signing the nonviolence pledge or turning in weapons. No real surprise there, of course. The police do NOT believe in or practice nonviolence and, indeed, are avid participants in AGGRESSIVE violence to force people to do the will of the police officers and government(s) for which the police work. Another wrong-headed move is featured in a story in Popular Science. A company has invented a “gun safety accessory” that supposedly will keep automatic pistols (not revolvers or long-arms) from being fired by “the wrong hands.” It has a system that locks around the gun safety (apparently NOT the trigger) that can store up to FIVE “authorized” users thumbprints and can be programmed by the owner, to recognize an authorized gunner “in a second.” And there will be a lefthanded version. It will retail for 200 bucks, which PopSci touts as “reasonable to save a child’s life.” My question is, how many children’s lives (and other’s) will be LOST because someone cannot get to and use a gun quickly? Among other things, last time I checked, many families have left- and right-handed people. But of equal concern will be how many progressive communities (and even states) will MANDATE this stupid little device? 200 bucks is still a lot of money to many of us. Indeed, many of the pistols people own cost less than that – people already are NOT able to afford to defend themselves amd this would drive the cost up further. And create a new “crime.” Maybe they need to get these for the cops. The cops, who more than ever seem to base their service on offers from the highest bidder. Or just grab what they can (that happened in Katrina, as I recall). Blacklisted News tells a fascinating tale from New Haven, Connecticut – emphasis on the “con” part. Apparently the cops are going into unlocked cars and taking anything in plain sight and putting them in a police station to be claimed by the owner (unless, of course, they turned out to be TWICE-stolen goods). They’ll leave a receipt, of course. And they promise they won’t take any other action if they happen to find something “illegal,” like money or weapons or a little herb… Right. Quick! A break from this doom and gloom. Feast your eyes on this little goodie. 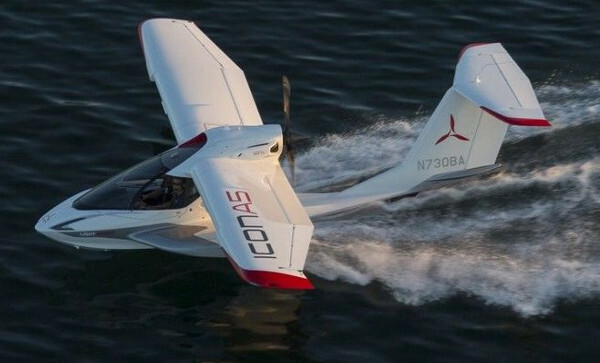 The Icon A5 seaplane, as featured on The Verge, requires a few things, and only a sports pilot’s license, to make it suitable for recon and even light attack duties in the coming domestic war. And it is fun! Mama’s Note: Oh, that is truly beautiful. Wish I could have one. Just two little problems with that… I don’t have the $250,000 to pay for it, and no body of water to land it in. Anyway, I’ll hold out for a flying car. Buzzing herds of antelope on the way to the grocery store sounds like so much fun. Mama’s Note: My mother used to warn us often to be careful what we asked for… because sometimes we truly do get it, and often won’t like it. This entry was posted in Commentary on the News and tagged disappointment, France, hoploclasts, hoplophobes, Islamic wars, Local tyranny, NATO, Nazgul, stupid lawsuits, the Ummah, theft by cops, war. Bookmark the permalink.